The newborn onesie I bought for little man. 🙂 Yes, the one-size diapers are bulky on newborns, but they work! They are on the higher end of cost when it comes to cloth diapers, but that is because they are all-in-ones (meaning no additional inserts or covers to buy) and one-size. We started using them when Stella was four weeks old (9.5#), and in retrospect, we easily could have started them as soon as the disgusting meconium poop was out of the way! The other option is to buy sized fitted diapers / newborn diapers, which I might get a few of for this new baby. When Stella was 10 months old, CottonBabies.com had a “seconds” sale, which is when they sell diapers that have cosmetic imperfections for a discounted rate. I picked up (4) Bum Genius Freetime All-In-One One-Size Cloth Diapers with snaps for $50 ($12.50/ea) at that point, simply because I wanted some “girly” colors and to be able to extend my wash schedule a bit. The Freetimes are “semi-attached,” which means they’re still AIOs, but you can add more inserts under the semi-attached flaps for extra absorbency if needed (we did this at night sometimes). I also bought 4 inserts – 2 bamboo & 2 hemp – that we use to “stuff” the Freetimes with at night. In the early days, Stella would go through up to 10 diapers a day, so I washed diapers every 1.5 days. By my four month post and on, it was more like 6 diapers per day, so laundry every 2+ days. After adding 4 extra diapers to my stash at 10 months, I could get away with laundry every 3 days (and honestly, you wouldn’t ever want to go more than 3 days without washing dirty diapers!). Both were washed only with Charlie’s Soap or Rockin’ Green, which are both cloth diaper friendly detergents. A couple of my cloth diapering mama friends switched to Tide original powder with good results as well. I’ve used Funk Rock about once a month for the past six months to help with the ammonia issues that cropped up around one year of use, and they have all been line dried outside about 70% of the time. I used to use bleach about once a month to try to help with the ammonia, but quit that once I started with Funk Rock once every few weeks. Line drying outside has kept them nice and white too since the sun bleaches any stains out – bonus! My Elementals have nearly three times as much wear on them as my Freetimes, and unfortunately they are showing it. I’ve done some research, and it looks like this is a common problem with natural fiber diapers (as opposed to synthetic blends). The Elementals are made with organic cotton insides, and around 18 months we started to see some holes on the edges along the leg holes. The outside shells still look perfect, and the cotton is still soft and absorbent, but there are definitely holes. We also have had a few issues with leaking out the sides in the last couple weeks of use, and I don’t know if it was coincidence or related somehow, but it was definitely frustrating after having only a handful of leaks EVER with the cloth diapers over their lifetime of use. At this point we are using mostly disposables at night, just for absorbency reasons. Even with a hemp liner in the Freetime, she was really wet by morning and her tush was a little red (this just started happening the last couple of months). We have bought a box of disposables here and there over the past 20 months, but not often by any means since we used cloth almost exclusively both at home and at daycare. 12 of our 15 original cloth diapers were gifted to us at my baby shower, and even including the detergent we have bought ($50 worth – and I use that for my laundry too! ), the diaper sprayer ($50), and the wet bags, we’re spent a pretty minimal amount to diaper our kid. Our water bill never went up (we must have some fixed minimum rate allowed that we’ve never exceeded? ), and we haven’t noticed our electric bill changing, so really, for a couple hundred dollars, we have escaped diapers fairly unscathed financially! If you have any other questions on cloth diapers, feel free to leave a question in the comments and I’ll try to answer. I’m by no means an expert since we never tried different styles/brands, but I sure loved my BG AIOs! Even with the hole issues that we’re now having with the natural fiber diapers, I still love how soft they are, I love that they’re organic cotton against my child’s bum all day, and I love that for a minimal cost, we were able to get through the diapering phase of babyhood. If I had realized we would have more than one child, I’d have probably bought a larger supply of diapers up front just to cut down on the amount of wear & tear (use) on each diaper to get us through both kids with one set. Still, even if I have to buy a whole 2nd set of diapers, we will still be saving money and be doing something good for the environment. Win/Win! **Here is a great video and chart that highlights the differences between the 3 main types of Bum Genius Diapers if you’re interested. B keeps asking me when I’m switching Bryson to our cloth diapers. I’m not looking forward to it – the diaper pail is where we find lots of toys that Matthew “loses.”. Gross! LOL, dang kids! We don’t have a pail – just a large zippered wet bag that I hang from the side of her vertical laundry basket, so no toys end up in it. Maybe try that? Have you looked into Kawaii diapers at all for your future addition? I’ve never used them nor do I know if they have an organic option, but a few of my friends love those diapers and swear by them. I know they often have weekly specials where you can get really good package deals and they quite a few fun prints. I myself just own four BG 4.0s that I use at night and the rest of the time I use prefolds/flats/receiving blankets with Flip or Econobum covers. I only have 3 Flip covers and 2 Econobum covers in my rotation and they are still in great shape and going strong after 22 months of use, so cloth diapers of all types are definitely worth the investment. I agree with going with snaps. One of my Flip covers is velcro and the velcro was shot after 6 months of use, but the rest with snaps are still going strong. I would think cotton babies should be running another seconds sale soon, its been a while since they have had a good one. And congrats on finding out your having a boy 🙂 I’ve been off in the mtns. for a while and have been catching up on all the blogs I follow! I love the bumgenious elementals! We’ve used a lot of different kinds of diapers and those are my faves. We don’t use cloth, but I think that sounds totally acceptable to have found some holes after so much use and such a long time. I mean, I totally get that it would be super annoying if you were told not to expect that, but my girls put so much wear and tear on clothes that only fit them for a few short months. I’m impressed they stayed great for that long! Just read the comment about Kawaii diapers- these were the ones we used when we CDd Grayson and I loved them- they worked great, and were so much less expensive than other brands- ours were Velcro though. Loved reading this since I also use cloth diapers. We use BG Freetime’s and Fuzzi Bunz Elite’s with a few Knickernappies and DryBee’s thrown in. I have a large and a small wet bag and have use the BG and Rockin Green detergent, with the odd time using Tide powder detergent. I soak my diapers in our laundry tub before washing and I found this gets out a lot of the ammonia and urine and the diapers are just a lot cleaner and smell much fresher! Just an FYI. Cotton Babies is doing a seconds sale right now. They have quite a few of the organic ones listed at the moment as well as a bunch of other types including newborn BGs. But it looks like they are going fast. I got some Flip covers and a lot of the colors were selling out as I was putting them in my cart. Well crap, thanks for the heads up! Just got home from my walk and the newborns are all sold out already – boo. 😦 I’ll have to keep watching for those! I’d keep checking back over the next few days. I know the last couple seconds sales they had, they would randomly add stuff for a few days after it started, so hopefully they add more colors in the future, they only had 3 colors of newborns listed when I was on the site. I know when I got my BG 4.0s in a past sale all they had listed for several days was white and then a day after I bought them they added almost all the colors 😦 I think they were listed for $7.25, hopefully you can get some! I am seriously considering this for the next kid. I just got an email and ordered 3 more BG one size with snaps in neutral colors. They don’t come with inserts but I have a few extra. For $11.75 each and free shipping, I was happy with that! we’re planning on cloth diapering the two growing in my belly right now, so this post is very very helpful! i think we’re going to go with all-in-ones. with double the diaper changes, i figure that cutting out time anywhere we can will be crucial. question, if you knew the holes were going to be happening to the elementals, would you still choose them over the regular ones? Yeah, I think so! I’m starting to watch for sales, and I’ll probably be buying a few more of the Elementals for kiddo #2. Stella has been back in diapers at daycare for the past cpl of weeks (damn potty training regression) and we haven’t had any leaking problems, even with the holes, and like I mentioned, we didn’t see a single hole until around 18 months (and heavy use, since I didn’t have many diapers in rotation). We use Softbums and really like them. I feel like we’ve had quite a bit of wear and tear on them though, so if we have another child, we will probably replace a few here and there…especially if we have two in diapers at the same time. (Harriet’s not seeming especially interested in potty training yet, so who knows what the timeline will be.) This is all really informative! 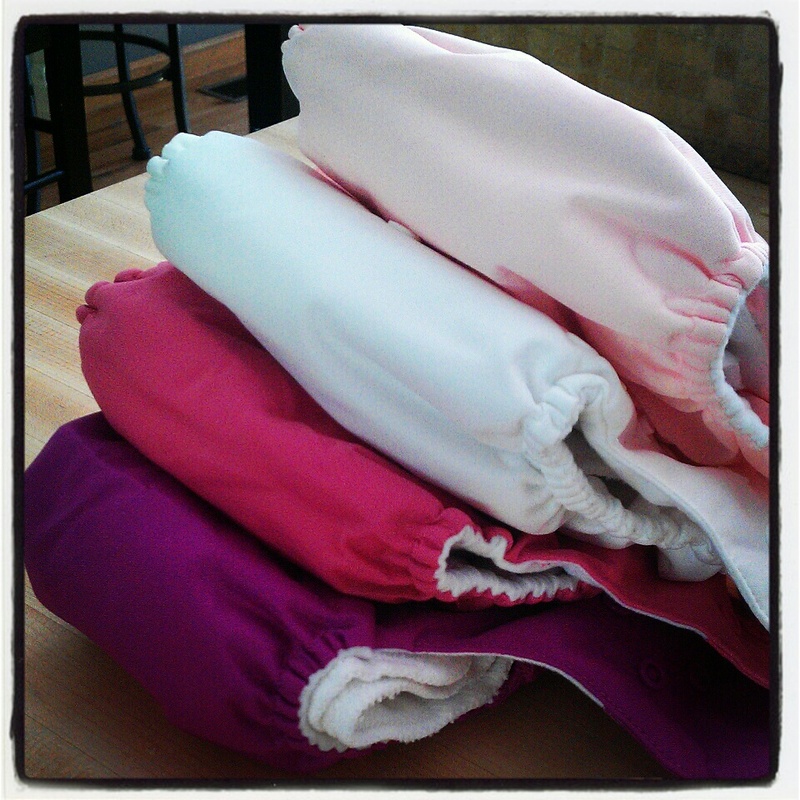 If people have questions about cloth diapers, I’ll have to remember to send them to your blog! ← 19 Weeks – The Turning Point!